On the advice of a developer friend some months ago, I decided that I should really get going with using Gulp as my task-runner with MAMP. Up until this time I had been using PrePros as my goto for local development task running. PrePros is a task-runner app and is available here. PrePros is good and has served me well. I’ll continue to use it in the future. The issues for me were that I can’t take PrePros with me to all my development jobs, other devs don’t use PrePros, and I can’t share setup files if other devs I work with don’t use it. Enter Gulp, the free open source task-runner available via the Node package manager. I already had Node setup from some work I was doing with React and Vue.js. If you don’t have Node installed, here’s a great tutorial for how to install it on a Mac. So I did a little Google searching and came across this Gist by Sridhar Katakam. He includes some instructions on where to install the gulp.js file and some small changes to be made to the gulp.js file like siteName and username variables. Easy enough, right? 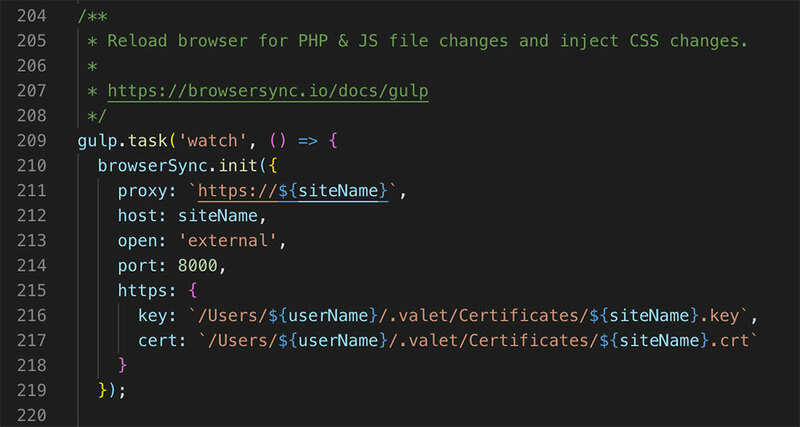 Comment out from lines 213 to 218 and save your gulp.js file. Make sure MAMP is up and running then run ‘gulp watch’ in the terminal window from the genesis-sample folder. Your site should pop up in a new browser window within 10-15 seconds.